Infection control is the effort to stop infections from transmitting from person to person. My long-term research interest has looked at ways to prevent antimicrobial resistant bacteria spreading, either through use of devices, new practices, or different uses of antibiotics. 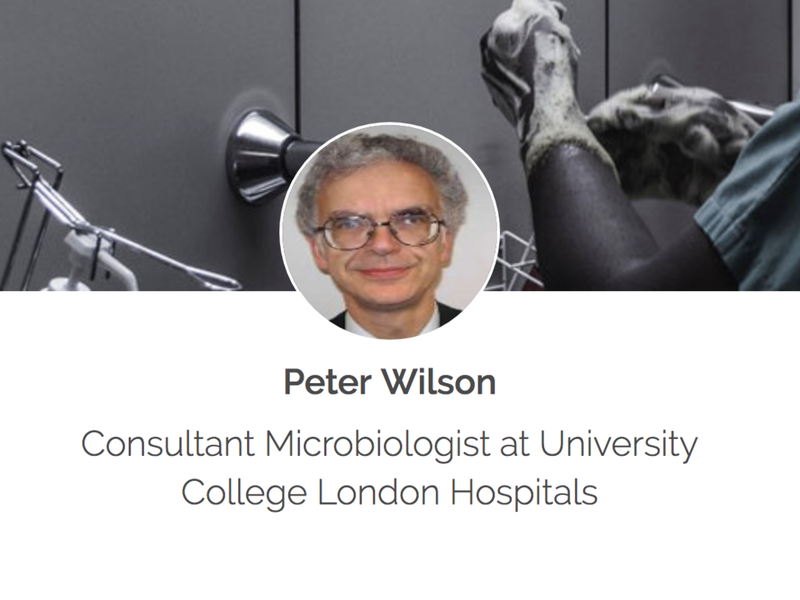 In the United Kingdom, microbiologists spend a lot of time liaising with doctors who care for infected patients. We provide a bridge between the microbiology laboratory and the hospital wards. We see patients ourselves, as well as advise on antibiotic treatment, prevention of infection transmission, and how to keep our antibiotics active by preventing development of resistance. We are on the front lines of combatting infection transmission. We see the problems while seeking the solutions. Amongst the chief issues is that only about 25% of UK hospital beds are in single rooms. The rest of the beds are located in shared, open accommodations like bays or wards. This is in contrast to the private sector, where essentially all beds are in single rooms, and it is much easier to stop an organism from spreading. The reason for the difference in the risk of spread between bays and single rooms is threefold: First, staff are reminded to wash their hands in these environments. Second, they do not simply walk near patients on their way to somewhere else. Lastly, doctors and nurses must make a particular effort to go into the single room. Conversely, people constantly walk through wards that accommodate up to five patients at a time. If even one of them has an infection, or the person walking through did not wash their hands and has touched a contaminated surface, the chances for transmission are greater. We believe environmental contact is how most infection is transmitted. It’s also easy to forget to wash your hands when walking from one bed to the next bed, and unwashed hands account for two thirds of transmission. The remaining one-third is airborne. But a physical barrier between beds reminds people to wash their hands and reduces air transmission as well. We identified a need to either temporarily increase the number of single rooms or to discover ways to encourage people to wash their hands as they move between patients within these bays. However, the public health system simply lacks the funds to convert all hospitals into single rooms. The vast majority are mixed. On top of the limited funding, we now see increasing antibiotic resistance. We need new antibiotics, but there are far fewer being developed as we would like. It’s critical that we do everything in our power to stop these resistant organisms from spreading without relying on antibiotics. Naturally, we need to be both scientific and creative in our approach to this problem. There have been many proposed solutions. It is common for most infection control departments to introduce bundled approaches, a series of five or six evidence-based measures used together to encourage infection prevention. Education programmes have been reasonably successful. The average hand hygiene compliance has improved from approximately 25% to 60–80% over the last decade. Much of our investigation has focused on optimising surfaces in an effort to make them less hospitable to the survival of the organisms. For example, a rough surface easily allows the bacteria to stick to them and they do not stay long on a smooth surface. So adapting physical surroundings have been a top priority. While it is too expensive to build more hospitals with more single rooms, it is less so to introduce barriers between beds. The Department of Health instituted a program called SmartIdeas Project in 2010 to bring about different solutions to be implemented at the hospitals and studied for future application. We identified three notable innovations. In an effort to innovate novel ideas to reduce infection transmission, they provided a fund and invited inventors to take on the challenge. A panel—including myself—judged the wide variety of ideas and inventions, which included temporary side rooms, glass LCD privacy screens, and retractable room dividers. The successful inventions got a bit of help along the way. We would test them in our hospital, allowing the companies direct access to front-line healthcare workers so they could observe and utilise their feedback to adapt their product accordingly. One of the promising solutions in the program was KwickScreen, the retractable room divider that fits into a mobile, cylindrical container. The end of the screen is on a small pair of wheels and can easily be pulled out. When we had a patient who needed source isolation in a bay and we did not have a single room to put them in, we would use a KwickScreen as a means to provide physical separation. Another option was the temporary single room, but it could only be assembled if there was enough space. Interestingly, like the other inventions, KwickScreen did improve hand hygiene. The simple presence of a screen reminded individuals, particularly the doctors, that they needed to wash their hands when approaching a particular patient and upon leaving. KwickScreen also mounted alcohol hand gel on the leading edge as a second cue to encourage staff to wash their hands. Hand hygiene compliance increased from 50% to approximately 75%. When we watched doctors coming toward the patient, none of them washed their hands if there was no visual reminder, like the screens or the room. When we put in one of the three solutions, doctor hand hygiene increased to 70%, overall. Clearly, doctors were not necessarily aware that they were approaching a patient with a potentially infectious pathogen and that they needed to wash their hands. Doctors should wash their hands with every patient, but they need to be reminded of the requirement. The large physical presence in the form of a barrier is effective in a way that notices on the end of the bed are not. You can't miss this visual reminder. We published a paper (ref 1) reflecting the outcomes of the SmartIdeas Project and conducted trials with a number of patients who did need source isolation. We distributed questionnaires for both patient and staff feedback so we could gauge whether they could be used in practice in addition to our hand hygiene study component. We also analysed whether people would decline to have them around their beds. No patient objected to having KwickScreen. A few patients objected to the temporary side room. Staff would not put patients with diarrhoea into the KwickScreen because it was not an all-around solution. They would only put patients into the KwickScreen who had illnesses spread by contact, like Methicillin-resistant Staphylococcus aureus (MRSA), for example. We took all feedback into account. Another area of focus was the material used for the screens. We did a great deal of sampling from the units themselves to see what organisms would grow on each surface. It was expected that we would find a bacterial presence on the KwickScreen near infectious patients. We had to be mindful of ease of cleaning and diligence in decontamination protocols so as not to spread infection. If you adjust what the screen is made of, that material can make a big difference. The tendency is often to use a rough plastic because they are easier to grip. Your hand does not slip off, but rough plastic can store 10 times as many MRSA as a smooth metal, for example. The best option is to have the smoothest possible surface. Of course, the designers have to judge that against having something that's so slippery you cannot even pull it. There was some compromise to consider. One of the greatest aspects of a program like SmartIdeas is that products are tested in real-life scenarios. All of these challenges identified were opportunities for the inventions to improve their offering based on real-world experiences. KwickScreen has taken that feedback and now has a more robust offering. They've produced artwork on the formerly blank screen, which helps to make it more acceptable to the patients who were split on whether they preferred a clear screen versus those who wanted additional privacy. We also scrapped the addition of disposal sinks that were attached to the KwickScreen, as individuals would rather use the plumbed ones. KwickScreen has gone for a smooth, easy to clean plastic for the screen material. It is always a tradeoff, however, since rough surfaces are less likely to transfer bacteria onto hands, with the opposite being true for smooth surfaces. Retractable room dividers can be used for infection control purposes in certain cases and can also be useful for privacy. A working group followed up on other KwickScreen applications such as privacy and gender separation issues after the SmartIdeas Project. It's sometimes quite difficult for companies in the UK to get a foothold because products must have a scientific basis in order to become widely accepted. Programs like SmartIdeas Project not only help companies come up with new ideas, but it helps them discuss with active working professional members what is useful. Companies like KwickScreen have been able to utilise the program to test their product, gather feedback, and improve their offering. It’s exciting to think what the future will hold. Ref 1: ‘Ward assessment of SmartIdeas Project: bringing source isolation to the patient’. Moore G, AliS, FitzGerald G, Muzslay M, Atkinson S, Smith S, Cryer P, Gush C; SmartIdeas Research Group, Wilson AP.